Posted July 12th, 2011 by SRECTrade. The Council of the District of Columbia unanimously voted, today July 12th, to close the DC SREC market to out-of-state systems. The Distributed Generation Amendment Act of 2011 (Bill 19-10) increases the SREC requirement in 2011 as well as establishes an SACP schedule through 2023. Once in effect, the bill will allow out-of-state systems registered prior to 1/31/2011 to continue to sell SRECs in the DC market. The DC Public Services Commission has not provided clarification on how the bill will affect out of state systems that have already granted DC registrations after the January 31st 2011 grandfather date. For more information on the bill please refer to our previous blog postings here and here. The bill is not yet law. It first must go through a 30-day Congressional Review process before it can go in to effect. Given these mechanistic delays we don’t expect the bill to go in to effect for at least another month. The following chart illustrates which out-of-state systems will be effected by the legislation. Posted June 4th, 2010 by SRECTrade. 1. This follows states like NJ and MD who updated their renewable portfolio standards by increasing the SRECs required. 2. PA has a very unique alternative compliance payment which currently resets to twice the average trading price of SRECs in the previous year. This potentially unlimited ACP could potentially be the most forceful incentives to ensure PA utilities actually meet their RPS requirements rather than pay the fine (despite impressive solar development in NJ, NJ utilities dramatically under performed the RPS requirements and paid million in ACP fines last year). 3. It’s unclear whether or not out of state systems currently registered in PA will be grandfathered in and would certainly hinder solar development in states like VA and NC who would likely sell SRECs into PA.
Pennsylvania solar installers, solar trade groups (e.g. msiea.net) and environmental groups (e.g. PennFuture) have all come out in support of the legislation while developer and solar owners within the PJM region (PJM map) might be amongst the naysayers. Posted May 10th, 2010 by SRECTrade. For customers looking to register systems in the DC SREC market, as we have previously stated, DC will accept applications from customers sited in the PJM regions and states adjacent to the PJM region where electricity is eligible to be transmitted into the PJM region. SRECTRADE will manage the application process for our EasyREC customers to ensure the system is approved. We previously reported that a facility was rejected out of New York state and have learned that the application provided that the electricity was not capable of being transmitted into the PJM region. The DC PSC was subsequently unable to get clarification in order to approve the facility. The same document describes New York as an “Adjacent PJM State” and the New York Independent System Operator (NYISO) as an “Adjacent Control Area”. The crux of the issue seems to be the wording “consumed within the PJM interconnection region”. Electricity flows bidirectionally between PJM and NYISO every day, the amount varying based on supply and demand in the two ISOs. An electron generated in NYISO clearly can’t be tracked (Heisenberg and all), so there is no way to know if a given electron generated by the grid-tied solar installation makes its way into PJM and is consumed. In fact there is no way to know if a given electron generated by any installation in any “Adjacent PJM State” makes its way to PJM and is consumed there, although it is possible that any electron generated in an adjacent PJM state will. Going even further, an electron generated by a system located in DC might actually be consumed outside PJM! As we see it, this leaves two choices on how to interpret the DC RPS rules. Either every grid tied generator in an “Adjacent PJM State” could be delivering their electrons to be consumed in PJM and therefore all are eligible to create DC renewable energy credits, or none can prove that their specific electrons where consumed in PJM and so none are eligible. How far back will DC accept SREC generation? We also get questions about systems that were installed prior to the application date in DC. Customers and installers will ask how far back DC will count solar generation for SRECs. DC will only count SRECs created in the current energy year (same as calendar year) as long as generation is inputted before the last business day in January. This means that, as of this blog post, any generation for a facility in 2009 will not count. Only generation from January 2010 onwards will be eligible for the creation of SRECs. Posted March 28th, 2010 by SRECTrade. The PJM Interconnection is a regional transmission organization. It serves to connect the electricity produced by the various utilities across a region. In several states, the Renewable Portfolio Standard legislation lets utilities count renewable electricity produced within the PJM region towards meeting the state’s renewable goals. In Pennsylvania, for example, a resident within the PJM region can apply for certification in the Pennsylvania SREC program. If your system is convered in this map, you can sell SRECs to PA! Washington, DC is similar to Pennsylvania in that both allow SRECs from anywhere within the PJM region, however DC will also qualify facilities that are eligible to deliver their electricity into the region. This may include facilities in states that are adjacent to the PJM region such as New York or Wisconsin. Ohio is another state that allows SRECs from out of state. In that specific case, the utilities are limited to buying 50% from out of state and only from states within the region that are contiguous: Pennsylvania, West Virginia, Kentucky, Michigan and Indiana. Washington, DC is similar to Pennsylvania in that both allow SRECs from anywhere within the PJM region, however DC will also qualify facilities that are eligible to deliver their electricity into the region. For these reasons, it is important to know what constitutes the PJM region to determine whether or not you qualify. 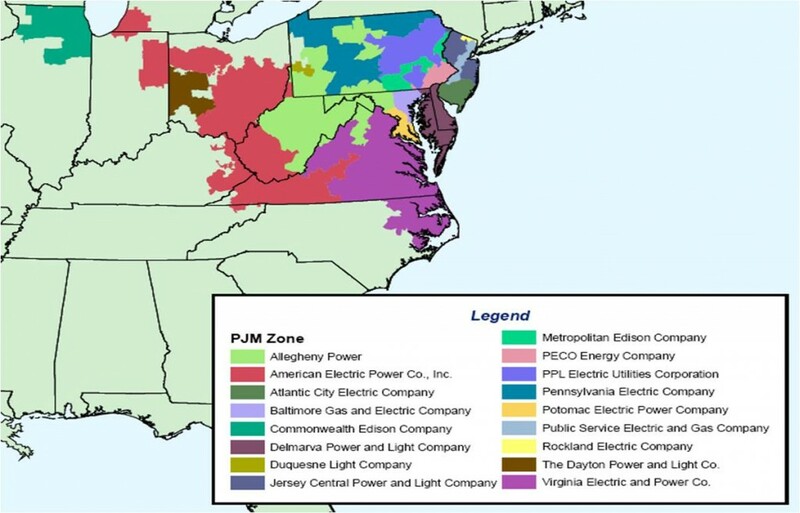 Here is a map of the region, along with the retail electricity companies who are served by PJM. Posted February 15th, 2010 by SRECTrade. 1. Understand SRECs: For a deeper understanding of what SRECs are and how the programs work, visit our SREC Program page. 2. Find out where you are eligible to sell your SRECs: Your state may or may not have a program, however your ability to sell your SRECs into other states could have a significant impact on the value of your SRECs. You may be eligible to get your system certified in many state programs, regardless of if your state has one or not. Everyone should check our Cross-Listing post to see the states in which they may be eligible for certification. 3. Get your system installed: SRECTrade works with several installation companies. In addition, you should be able to sign up for the EasyREC service through your installer. If they do not offer the service, then feel free to contact us directly. 4. Enroll with SRECTrade: SRECTrade provides two options. If you sign up for the EasyREC service, we handle everything else including submitting your state certification applications, creating your SREC tracking account and automating the sale of your SRECs in our auction. 4a. Get your system certified by your state: Once the system is installed, it is now ready to be certified by your state and any other states in which you are eligible. You can find out more on where you are eligible and how to apply on the Cross-Listing page. Every state handles this process differently, but we recommend beginning the application as soon as possible, before your installation is complete. 4b. Set up your SREC tracking account: Every state or region will use a different system for creating and tracking the SRECs. The Mid-Atlantic states use GATS, North Carolina uses NC-RETS, Massachusetts uses NE-GIS. If you opt to manage your own SRECs, you will need to have a tracking account with one of these registries. Once you have SRECs in that account, you can then post them in our auction. 4c. Create an account online with SRECTrade: This is the simplest step of all. Complete the online form to create your account and when your SRECs are available in your tracking account, log into your SRECTrade account, select the “Orders” link and place an offer to sell your SRECs. 5. Understand the timing: After you initially sign up, it will take a few months before you begin receiving payments. For example, if your system goes online on January 1st, your January generation will be recorded on February 1st. Your first SREC(s) will be actually credited to your account on March 1st. They would then be sold in the March auction, so your first payment would come in late March. After that, payments will come as SRECs are generated. Also note: some systems operate on a quarterly basis, rather than monthly. As these processes are refined, we will continue to update this post. Please feel free to contact us any time at 877-466-4606 if you have any questions. Posted in Delaware, Getting Started, Maryland, New Jersey, North Carolina, Ohio, Pennsylvania, SREC Markets, Virginia, Washington, DC, West Virginia | Comments Off on New to Solar? Posted January 25th, 2010 by SRECTrade. The DC Public Service Commission is responsible for approving applications to the DC SREC market. Their rule of thumb is that if your state has an RPS similar to DC you are guaranteed certification in DC. Currently those states include Maryland, Pennsylvania, Delaware, New Jersey and Ohio. Solar facilities built in all other PJM area states AND adjacent states are reviewed closely and the DC PSC will determine if they can be granted certification. Currently, they have not declined a registration from any of those states because of location. Based on the map of the PJM region, these states include: Indiana, Illinois, Kentucky, Michigan, Tennessee, Virginia, West Virginia and Wisconsin. Posted January 3rd, 2010 by SRECTrade. One of the benefits of the SRECTrade multi-state auction platform is the ability to cross-list in multiple states in which you have registered your SRECs. If an SREC is cross-listed, it will be included in any state in which it has been registered to be sold. SRECs will be sold in the state auction that offers the most value. In order to qualify to sell your SRECs in a state that accepts out-of-state SRECs, you need to get your system certified in that state. The following section has information on what states accept out-of-state SRECs and how to get your systems registered and obtain a state certification number. For EasyREC customers, SRECTrade can help you register in the states available to you. To get a Delaware state certification number, your installation must be located in DE. You must apply to become an Eligible Energy Resource. The link for the application is here. For more information, go to the Delaware Public Service Commission. Eligible to states within and adjacent to the PJM Region. For information on the DC registration process, see DC State Certification Instructions. To register in Maryland, your solar installation must be in MD and you must complete and file an application for certification as a Solar Renewable Energy Facility (REF) with the Public Service Commission. The link to the application is here. For more complete details on the process, see Maryland SREC Registration Details. New Jersey is a closed market, therefore only SRECs produced in New Jersey are eligible. New Jersey residents can apply for state certification at the New Jersey Office of Clean Energy’s website. North Carolina is still in the early stages of implementing an SREC program. The state is still accepting applications for a REC tracking system through December 15, 2009. More information can be found on the North Carolina Utilities Commission website. A sample application can be found here. Utilities in Pennsylvania are allowed to buy out of state SRECs from solar generators in the PJM region to meet the Renewable Portfolio Standard. If you are interested in selling in PA, you need to get your solar system registered. For a detailed explanation of the process with screenshots see our most recent post on Pennsylvania State Certification Registration Process. Posted November 25th, 2009 by SRECTrade. In the spirit of Thanksgiving, we’d like to thank a couple folks who have recently written about our services. Dave is a new solar owner from New Jersey who has chronicled his experience going solar in his blog at solarpowr.blogspot.com. In writing about his journey to go solar, Dave has shed a great deal of light on the entire process. He’s been an advocate for our services and we are excited to get him started! One of the the things we love about our business is the role we play in enabling solar. Matt of PIMBY Energy, LLC (i.e. Power-In-My-Back-Yard) recently signed up with us and sold his first SRECs in the PA market. He also wrote about his first experience selling SRECs. The exciting part of this news is that Matt is an installer in West Virginia, a state without an SREC program! Because he is in the PJM region, his SRECs are eligible for registration in PA, OH and potentially DC. Since Matt was registered in PA, his SRECs were sold in our November PA SREC auction. If you are in West Virginia or Virginia, we encourage you to reach out to PIMBY to find out more. Happy Thanksgiving! We hope you have a wonderful holiday. Posted in Installers, Virginia, West Virginia | Comments Off on Giving thanks! Posted November 4th, 2009 by SRECTrade. Check our DC State Eligibility post for more information. For detailed instructions on how to apply, go to the DC Certification Blog Post. Posted August 28th, 2009 by SRECTrade. For people interested in the West Virginia SREC market, unfortunately there is currently no market within West Virginia for solar RECs (SRECs). The existence of SRECs, as opposed to regular RECs, is predicated on specific renewable portfolio legislation that says x% of the state’s energy has to come from solar. West Virginia has a generic renewable standard, but no specific solar carve-out. This means that the RECs that are applied to the West Virginia renewable portfolio standard are not considered SRECs, but rather generic RECs. RECs trade at a fraction of the price of SRECs because the alternative compliance payments for solar tend to be higher when there is a carve-out. This is primarily because solar is still more expensive than other renewable energies and needs additional incentives in order to compete. In addition, the renewable portfolio standard requirement of 10% in West Virginia does not come into effect until 2015. Utility companies have until 2011 to develop a plan for procuring renewable energy to meet the requirements beginning in 2015. An SREC market in West Virginia, if it were to develop would both take time and adjustment to the state legislation as it is today. Even the REC markets won’t pick up in West Virginia until 2015. However, West Virginia is within the PJM regional transmission organization which means that residents may be able to certify their solar systems in Pennsylvania. We highly recommend doing this because they would be considered SRECs in PA and therefore have a much higher value than they ever would in West Virginia. You can find the information to register here on our Pennsylvania Cross-List Blog. North Carolina and DC are two other markets where West Virginia residents may consider selling their SRECs. Our Cross-Listing section covers most of this information. See also the West Virginia Renewable Porfolio Standard.